Tamil Nadu 12th Business Mathematics Question papers - In this page, We have uploaded the Tamil Nadu HSC Business Mathematics Previous year Question papers. These Question papers are Collected in order to help the Students who are attending 12th Public Examinations. Already Tamil Nadu 12th Exam time table 2018 is announced and its time for the students to start preparing for the exams. Below is the direct link to download HSC Business Mathematics previous year Question paper. Here we have provided TN 12th Business Mathematics March 2016 Question paper, TN 12th Business Mathematics June 2016 Question & also TN HSC Business Mathematics Oct 2016 Question paper. In future, We will be updating TN 12th Business Mathematics Question paper 2017 also. Hence, Check regularly to download Tamil Nadu 12th Business Mathematics Question paper online. 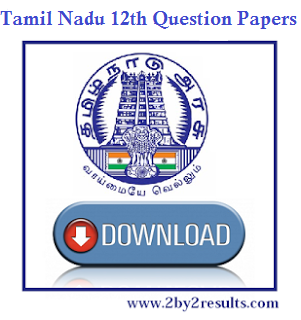 Download Tamil Nadu 12th Business Mathematics last year question papers using above links. If you have any doubts or need further help, you can comment below or write a mail to us in 2by2results@gmail.com.